It's Nanné here today to share a card I created using the new Wishful Thoughts and Flowers in Bloom stamp sets.. I absolutely love the flowers in the Flowers in Bloom stamp set.. 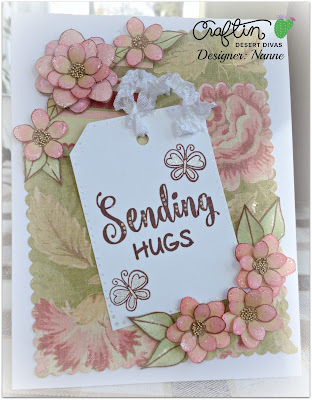 I cut a piece of white cardstock and punched the edges to make a tag, stamped the sentiment from the Wishful Thoughts stamp set and the butterflies from the Koala-fied stamp set, using Sepia Archival Ink and then used my Glitter pen to add some touches of detail.. I layered my flowers by gluing them together and for final added detail, I dabbed some glossy accents in the middle and added some tan colored micro beads..